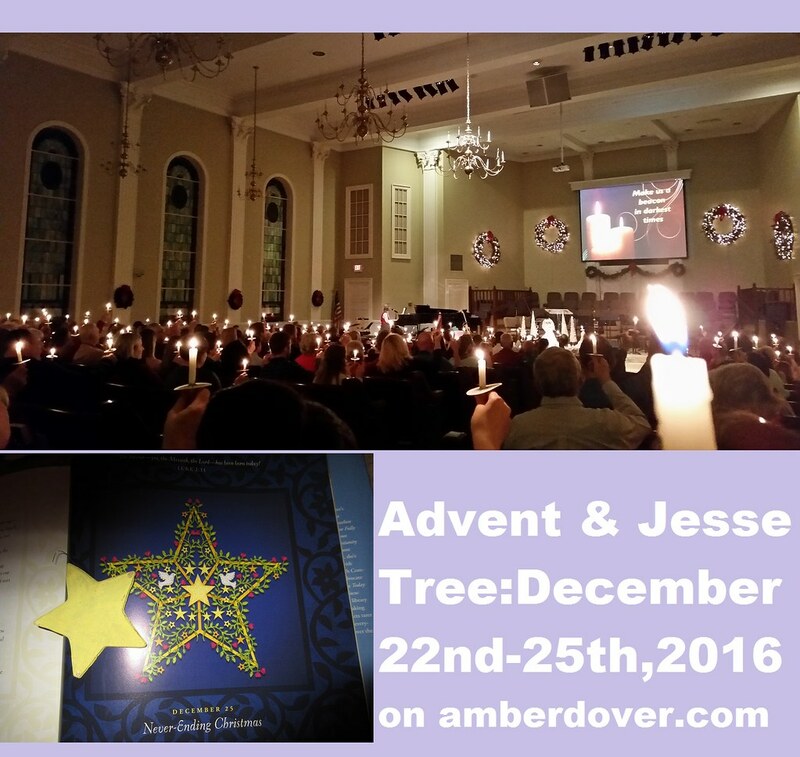 In this post: Advent fun and Jesse Tree devotions and ornaments for Dec. 22nd-25th. A year of dates and Black Friday Pie! Hello, dear ones! I pray you had a wonderful Christmas. I’m happy to wrap up our Jesse Tree/ Advent posts. Maybe next year I’ll combine the devotionals in an Ebook. For now, here’s the rest of our Advent and Christmas day. The guys watched A Muppet’s Christmas Carol. I wanted to take Michael to a live play of The Christmas Carol but we opted for something cheaper. I took a break from holiday busyness and tried to relax. My mom got me a coloring book for Christmas. I colored a page while soaking. The candle was my prize at our group’s Christmas party. 22. Mary’s Heart~ Read Luke 1:28-35, 38. The Jesse Tree ends with the miraculous. God called Mary to do what seemed impossible…give birth to the Son of God. Sure Elizabeth was having a baby in her old age, but Mary wasn’t even married yet. She could have laughed and doubted what the angel told her. Instead, she accepted the good news and sang praises to God. Has God called you to an “impossible” task? Rejoice! Nothing is impossible with God. If you can believe the Christmas story of a virgin birth then surely you can believe that God will get you through your own story. I pray you will have great faith this Advent. Activity: Watch a Nativity movie or put on a family Nativity play. I don’t have any pictures, but we went out to eat at a nice restaurant. We had planned on seeing more Christmas lights but the Japanese food didn’t sit right with everyone. We also saved our funny Christmas movie marathon for another day. 23. Joseph the Carpenter~ Read Matthew 1:20-23. Jesus’ family tree includes a stepfather. Joseph was called by God to be the stepdad of God’s Son. Imagine raising God’s Son as your own! It took courage for Joseph to take Mary as his wife. People probably looked at him differently. They may not have understood why Joseph’s fiance was pregnant before they were married. Yet, Joseph was willing to risk his reputation and follow God’s plan. Jesus would not have Joseph’s blood in his veins but Joseph would treat him like his son. He would teach Jesus his trade, that of a carpenter. What faith! What courage! May we have the same courage when God calls us to do something that may risk our reputation. Let us trust God and not fear man! Activity: Buy a simple wooden kit from the store (a model car or airplane?) and let the kids put it together. We were running a bit late for our church’s Candle Light Service. We had to sit in the lobby because of the crowd. Near the end, we slipped in the back to light our candles. When we got home we had a nice dinner of Black Friday Pie and ham. We all opened one gift. Here’s Leeland playing with his new sock puppets that Michael made him. 24. The Manger~ Read Luke 2:1-7. Our Jesse Tree gives birth to its final leaf in the most humble of places…a stable. God’s Son, Jesus, the King of Kings, was born in a stable and laid in a manger, a feeding trough for animals. Why would God choose such a place for his only begotten Son? I can only guess, but I do know that Jesus came for all….kings and all the way down to the humblest of people. He didn’t come in a big parade. He didn’t wear fancy clothes. He came in the dirt and His arms opened to the dirtiest…all of us covered in the stench of our sin. Christ, the pure Light of the World, came down to our dark mud hole and cleaned us up by His blood sacrifice on the cross. The manger reminds me that Jesus is accessible. We don’t have to worry that this King will turn us away. All we have to do is believe and confess Jesus as our Lord, then we can enter the kingdom. It doesn’t matter if you’re a president or a garbage man. This humble King accepts all who accept Him. Come to Jesus just as you are! Activity: Visit a petting zoo or a farm. You can also watch a video about farm animals instead. Day 25 ~ Christmas Day! The boys enjoying their gifts. Chris bought more ink for my typewriter. I got Chris a gym membership he’s been wanting. I also gave him a year of dates folder. We ended the night by grilling out and watching The Nativity Story. 25. The Star~ Read Luke 2:11-19 and Matthew 2:1-12. Angels, shepherds, and wise men bow before the King of Kings. They bring gifts. They bring praise. Even a star shines for Him. What will you give King Jesus? I know what HE wants. He wants all of you. Jesus wants your heart, your soul, your mind, and your strength. He wants your time. He wants every tear and every smile. Why? Because HE loves you. Jesus wants to be your Lord and your friend. Without HIM you just won’t work right. You’ll be like a broken doll on the Island of Misfit Toys. Darkness and death run from the name of Jesus. When you give your all to Jesus, you will be filled with HIS light and love. Oh, what a joyful existence! This is why the angels rejoice! This is why the shepherds and wise men bow. Finally, God with us! Finally, LIFE….LIGHT! Praise God and Merry Christmas! You can have the LIGHT of Christmas in your heart right now! You can be the star of Christmas…a light pointing the world to their savior! Activity: Make a birthday cake for Jesus. Make sure you have candles.